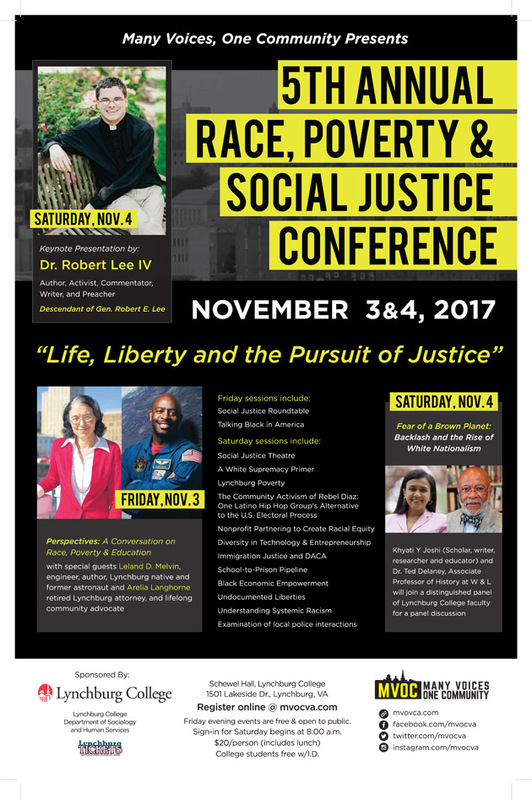 Many Voices One Community: the Lynchburg dialogue on Race and Racism will present this two-day conference on the campus of Lynchburg College. Last year's conference featuredKim Fiorde-Mazuri, Mortimer M. Caplin Professor of Law and Director of the Center for the Study of Race and Law at UVA, with the topic: Black Lives are All Our Lives: Reframing our Constitution’s Commitment to Racial Equality Based on Justice and Empathy, and a panel discussion led by Tamura Lomax, Founder of The Feminist Wire, Scholar, Activist, and Writer. All others please proceed below. Registration Required for all attendees. As a public service, no convenience fee will be added to registrations on LynchburgTickets.com.